Year after year, change is a constant within organizations. As technology becomes more innovative, employees adopt new skill sets and learning habits. For all L&D professionals, including myself, it’s critical to keep up with L&D trends to continue providing successful learning solutions. Last year’s L&D trends steered away from traditional classroom training and toward methods like micro-learning, content curation and video to enhance the experience. 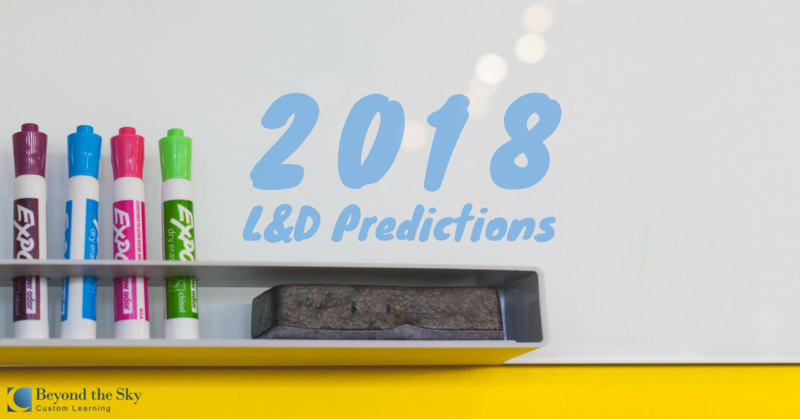 As we approach 2018, some L&D trends from past years are here to stay while others are on the rise. Let’s see what’s in store for this year! Mobile device usage (tablets, smartphones, etc.) is far greater than computer usage nowadays. But what’s attracting people to these portable gadgets? Mainly, it’s the convenience and added control over their social, shopping, or learning experience. The marketing industry recognized the relationship between consumers and their mobile devices back in 2010, while L&D slowly started to catch on in 2012 with mobile learning. According to the 2018 Learning Index Report by Udemy Inc., mobile learning grew 50% in 2016-2017 and this year it’ll continue to grow. If our learning industry mimics techniques used by the marketing industry, training should be ubiquitously mobile by 2020 – design for mobile, accessed by mobile and a completely unimagined different experience than what we’re currently producing. Gone are the days when learning was “one size fits all.” With machine learning and artificial intelligence (AI) in the picture, learning will be more personalized in 2018 than ever before. Machine learning and AI collects data from each employee based on their responses and behaviour. After analyzing this data, employees can be directed along the most appropriate learning path for them. This gives them a customized learning experience and the opportunity to improve on skills they already have. In a recent poll, the toughest challenge for 78% of L&D managers was keeping their employees’ skills up to speed with ever-changing business needs (2018 Learning Index Report). As a first-hand witness to rapid business change, I notice that corporations today require a more timely approach than the traditional 6-month training program development. This year, L&D managers will need an agile training development process that focuses on specific skills and lasts a few weeks, not months, to ensure employees can keep up. Just-in-time learning should be in high demand this year, while formal (classroom) training begins to wane. Microlearning and videos have a role, not because they’re trendy, but because they fulfill the needs of time-starved employees. Likewise, I see an increase in interactive video and PDFs, individualized learning paths, microlearning pieces and curated learning content. While job aids and easily-searchable reference guides or websites may have faded in past years, I see these useful tools making a comeback. L&D is encouraging empowerment to the learner through more informal, organic forms of learning. The learning trend is slowly, yet gradually emerging as it’s a slippery slope. We must provide accurate, high-quality training while supporting manager-led and employee-led learning. When organizations shift their mindset from L&D professionals as “training providers” to viewing employees as “learning empowered employees,” the outcome will be phenomenal. I see this trend continuing to strengthen. Virtual reality (VR) and augmented reality (AR) are making a boom in the learning industry this year. Having additional just-in-time information in context is now possible for any employee who uses AR. With VR, employees can receive “real life experiences” similar to an internship without having to be there in person; think of the high-heights worker who gets to experience this through a simulation. These learning methods help maintain a high-quality, learner-focused training experience. With a decrease in costs, going virtual’s more practical than ever before. The learning industry has faced some dramatic changes over the years. As we step into the new year, L&D’s expected to be more agile and innovative in meeting learners’ needs. 2018 Learning Index Report, Udemy Inc., 2017.